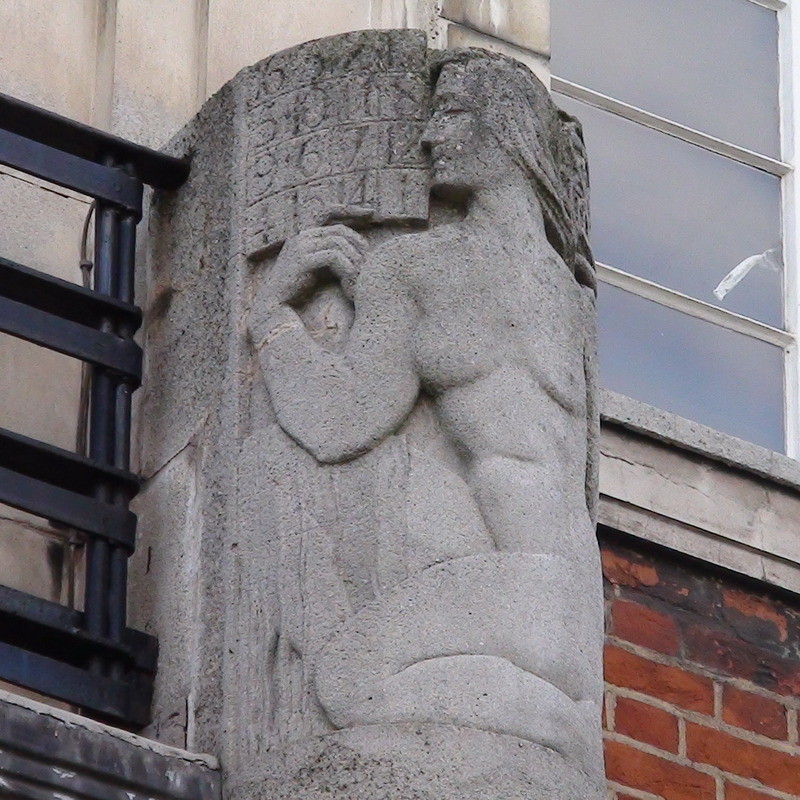 Not your standard Bloomsbury terrace, this Art Deco development has always interested us but now it's got us really puzzled. We've noticed that one of the floozies up the top of the pillars is holding a 4 x 4 magic square. At the Wikipedia entry for these things we learn that our magic square is known as the 'Chautisa Yantra'. There are many different types and the explanation of how to construct a magic square "of doubly even order" rather lost us, but we are sure you will have no trouble. There's one on the Sagrada Família and Albrecht Durer included one in an engraving, but we don't know why there is one on this Bloomsbury building. Haines House was built in 1938 as Mytre House and was a speculative development, so the first occupants, Linotype & Machinery Ltd, are unlikely to have had any influence on the design. Its listing entry says "sculptural embellishment: two engaged pylons with sculpted tops flanking the main entrance" and gives some information about the architect, Denis Edmund Harrington, but nothing that explains the magic square. Two other bits of info: the lady atop the other pylon is holding an hour-glass. In her other hand our lady is holding an astrolabe, an astronomical instrument (thanks to Rocker Ages for identifying this object). We've loaded three more pictures on our Facebook page. We asked Discovering London, who seems a well-informed chap, but he's stumped as well. Looking for connections between magic squares and astrolabes we found ourselves on a feng shui site and decided to abandon the search. They are both ancient ideas with roots in Arabia but we are no closer to explaining why they are here. 2014: Ornamental Passions reached this building. Now, we thought, we will get an answer, but OP, while addressing the question, doesn't solve it either. A splendid and unusual memorial.